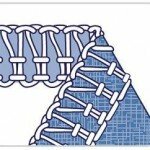 The 4 Known Types of Serger Stitches | Learn More About Them! In this article we will explore some of the most common types of stitches that a serger, also known as an Overlock machine, is capable of creating. The stitches below are ones that you will find in a typical serger you will use in your home. Why Should You Buy a Serger? Sergers are amazing machines that help to finish off a project. They create tight professional seams that are like the ones you will find on garments in the store. Therefore, it is a must-have if you are creating items that will end up in a farmer’s market or store. 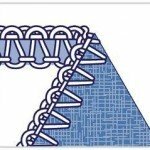 If you are new to serging, then you may not be sure how to choose the correct stitch for your project. Serger machines or overlockers are known for finishing edges, but once you get more comfortable with your serger and understand all of the stitching options, there is so much more you can do with it. 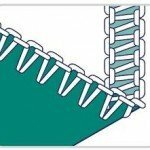 The following stitches are great at finishing seam edges and creating a tight, stable seam that will last for a very long time. You will find these seams styles in a lot of garments and other types of projects created with fabric. This type of stitch is best used on stretchy knits or woven fabrics that won’t have a lot of stress put on them. Because it uses one needle, that stitch isn’t a very durable one, but could be used to make a blink hem. You will likely find yourself using this stitch the most. The 4-thread overlock is use commonly used to finish the seams on clothing. If you want to create a strong, long lasting and durable seam you should use this one. This is a common thread used in stretchy clothing like yoga pants or other athletic wear. 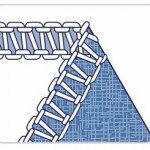 It has a distinct stitching pattern with one side having loops and the other side has horizontal lines (or “ladders”). It creates a very flat and thin stitch that doesn’t add a lot of weight to your garment. This type of stitch is used for very narrow seams on sheer fabrics. Commonly referred to as a “rolled hem” you will often see it on the edges of tablecloths, napkins and other types of sheer fabrics. It is decorative and adds a beautiful finishing tough to many household fabrics.